Ray Lakeman, from the Isle of Man, is the newest member of the Anyone’s Child Campaign. 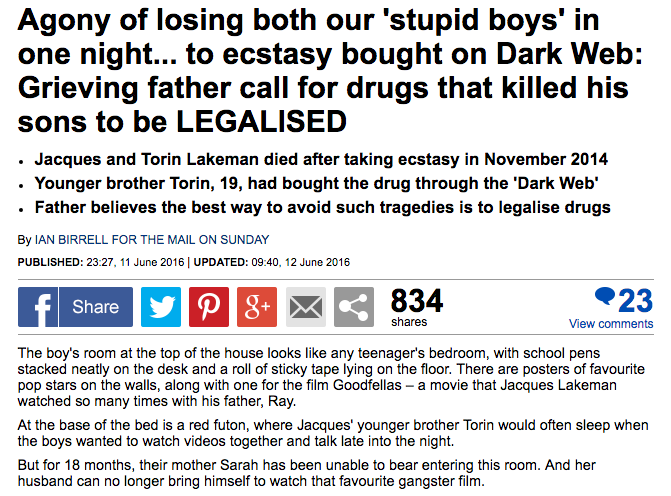 He told his tragic story in last weekend’s Mail on Sunday, where he explained how his two sons, Jacques, 20 and Torin, 19 died side-by-side having accidentally overdosed on ecstasy. He explains he has now joined Anyone’s Child and is campaigning for the legal control and regulation of the drug market. Why? Because if ecstasy had been legally regulated so the packaging had dosage instructions – like thousands of legal pharmaceutical drugs – his children would have come home, not ended up in a mortuary. The full Mail on Sunday article can be read here. The Mail on Sunday’s readership is a key audience for this campaign. With 1.5 million copies distributed daily, a readership of some 4 million, and the most viewed news website in the world, the sheer scale of the mainstream exposure Ray’s story has given to this issue is also vital. But equally importantly, historically politicians have been hugely fearful of The Mail, and Mail on Sunday – especially around the issue of drugs. Many continue to state both ‘behind the scenes’ and publicly that they won’t engage with the issue of drug policy reform for fear of how the Mail will report it. Yet, our experiences show that this fear is not well-founded. In 2013, Transform conducted polling with IPSOS Mori which showed that over 61% of Mail readers would support a review of current drug policy, and around half back cannabis law reform. The comments under the article about Ray also show that much of the readership is far from the way it is often caricatured to be on this issue. However, while it is the readers that should concern politicians most, having a major article making a powerfully pro-reform argument in this way should also reassure them that the editor of the Mail on Sunday at least is not as closed to taking a rational approach to the drugs issue as they might assume. Irrespective of that, however, the UK now has record levels of drug deaths – some 50 bereaved families each week – and the shameful honour of topping the table for the most such deaths in Europe. So it is time for our politicians to show leadership, because whatever their fears about what a newspaper might or might not say about them, they should not be putting that ahead of the lives of all those people like Jacques and Torin, who are dying week in and week out. And the families like Ray’s that are left behind. So we are calling on our politicians to stop hiding behind the excuse that the Daily Mail won’t let them speak out, and show leadership in calling for reform of the UK’s drug laws. Now. “My message to Mr Cameron is you are capable of changing this. You can make it happen. Those who choose to take recreational drugs for whatever reason, should have the right to know exactly what they are taking without fear of prosecution or the possibility of a life-changing criminal record. Banning does not work, and never will. We’re always looking for wider support and for more families to join us, so if you’d like to get involved, please email jane@tdpf.org.uk to find out more. Extremely sorry for your loss. And lots of respect for having a measured and informed view on drugs and drug taking.. Please go to our main website at http://www.tdpf.org.uk and sign up at the top. Thanks! My nephew died in January from an accidental overdose of street heroin, there was 6 times the lethal dose in his bloodstream. We didn’t even know he was injecting, he went from pills on the internet to heroin. The police aren’t even trying to track down the dealer who sold it to him. If drugs were regulated, I think he might have stood a chance. I know from posts on LeapUK that deaths from drugs are escalating, it’s out of control. It feels like children are dying and noone cares.